Karnataka Anganwadi Worker Jobs. For the posts of WCD Karnataka Anganwadi Helper candidate must have qualified 4th class. Candidates who are interested in these vacancies they can apply for their own village or ward or municipal as available vacancies through online only. 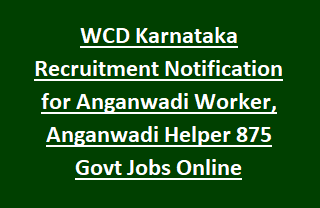 Online applications for this WCD Karnataka Anganwadi Worker/Helper Jobs will be accepted through the official website of http://anganwadirecruit.kar.nic.in/. Last date for applying online for these vacancies are may vary depends upon the district. More details about this WCD Karnataka Recruitment of Anganwadi Helper/Worker Jobs in Shivamogga, Ballari, Haveri District and Chikkaballapur district are given below. Online applications will be accepted through Anganwadirecruit.kar.nic.in. District wise separate starting date and closing dates are given below. Currently vacancies in available in the districts of Bidar, Belgavi/Belgaum, Mandya, Haveri, Shivamogga, Ballari, Chikkaballapur and Chikkamagaluru. Certificate verification dates, interview dates and merit list dates will be available on official website and notifications. For Anganwadi Worker/Helper Jobs age limit is 18-35 years. For Anganwadi Helper jobs 4th class qualification is required. Candidates will be selected based on interview only for this vacancies. Candidates who are belongs to the native ward or village they are only eligible for applying the available vacancies.